The 'uttarakhandroadways.com' is an initiative to make out-station travelling a pleasant experience. This site caters to the need of all facilities related to travelling in and throughout the entire region of ever-exciting Uttarakhand state. 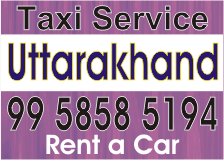 We are facilitating car booking or cab rental services for your journey to and from Uttarakhand. Our services include world class cab rental service for both the One-way drop as well as Round-trip facility from your doorstep to anywhere you want to go in Uttarakhand. As an introductory offer we are having some wonderful and exciting deals for our customers. the most glorious hill station in north India. to nature lovers in all its pristine glory. The Pindari Glacier is an unsurpassable and an exhilarating experience. The scenic beauty and the tranquility prevailing this region has an unbeatable charm.. Kafani glacier lies just close to Pindari glacier. A Journey to Cultural Capital of kumaon "ALMORA"
Ranikhet offers an excellent view of Kumoun hills with the panoramic view of the Himalayas. The sights, sounds and smells leave the onlooker spellbound. A Wild-Life Journey to "Jim Corbett Park"
Thank you once again for your very good service at reasonable rate. Keep it up. All the best. Thank you for such a nice cab service, driver behave and cab condition was excellent. I am heartly thankful to 'Go-nex Adventure Team' for making our trip so exciting & wonderful. Thanks a lot to Go-nex team for Making our stay pleasurable one. Thanks for best arrangement for staying at jungle Camp. This site is owned by a private Organisation.